Malaysian authorities have accused ethnic Indian activists of having links with Sri Lanka's Tamil Tigers, a charge the campaigners said could see them detained under internal security laws. Leaders of ethnic rights group Hindraf, which last month organised mass anti-discrimination protests that were broken up with tear gas and water cannons, have already been slapped with sedition charges. Police Inspector-General Musa Hassan accused them of seeking support from terrorists, smearing Malaysia's reputation, and inciting racial hatred -- a serious charge in the multicultural country dominated by Muslim Malays. "Of late there have been indications that Hindraf is trying to seek support and help from terrorist groups," Musa said in a statement carried by the official Bernama news agency late Thursday, without giving any details. However, Attorney-General Abdul Gani Patail said Hindraf was suspected of involvement with the Liberation Tigers of Tamil Eelam (LTTE) whose campaign for an independent homeland has left tens of thousands dead since 1972. "Somebody lodged a report based on the grounds that these people have gone out to contact the LTTE. We all know that the LTTE has been declared a terrorist organisation," he told reporters. 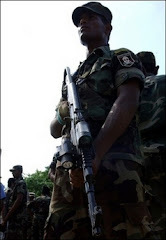 "Everybody in the world is worried if there is an LTTE connection," he said, adding that police were investigating the issue. Malaysia's ethnic Indians, who make up eight percent of the population, are mostly Tamils -- the descendents of indentured labourers brought here by the British colonial rulers in the 1800s. One of Hindraf's leaders, P. Uthayakumar, said the police chief's salvo raised the prospect of Malaysia's controversial Internal Security Act (ISA) -- which allows indefinite detention without trial -- being used against them. "They are trying to lay the foundation to arrest us under the ISA or to charge us for a criminal offence and deny us bail," Uthayakumar told AFP. "At all costs, they want us locked up and behind bars when all we are doing is highlighting the marginalisation and permanent colonialisation and racism against Indians here." Uthayakumar said he would write to Musa demanding he provide evidence of the alleged terror links, or face a 10 million ringgit (three million dollar) defamation lawsuit. Musa also dismissed as "false, baseless and malicious" the activists' claims that ethnic Indians are marginalised in terms of education, employment and wealth. "Their actions also have the potential of creating racial conflict in the country," he said. In a court session Friday, the government sought to overturn a decision that allowed three Hindraf leaders including Uthayakumar to walk free from sedition charges related to speeches they made last month. The speeches criticised Malaysia's system of preferential treatment for Malays, who make up 60 percent of the population. The court adjourned the hearing until Monday. Opposition leader Lim Kit Siang, from the Chinese-based Democratic Action Party, slammed the police allegations and called on the government to drop the attacks and instead listen to the concerns of ethnic Indians. He filed for an emergency debate on the issue in parliament on Monday, saying that levelling the terror allegations "without any evidence whatsoever is a matter of grave national concern". Earlier this week, 31 ethnic Indians were charged with attempted murder over the wounding of a police officer during a rally at a Hindu temple on the eve of the November 25 mass protests organised by Hindraf.